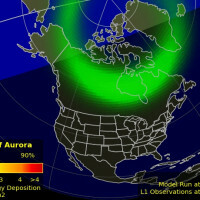 Earth is exiting a stream of solar wind flowing from the indicated coronal hole. Credit: SDO/AIA. Noctilucent Clouds The northern season for NLCs is finished. 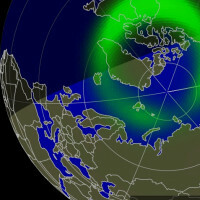 According to NASA's AIM spacecraft, the last clouds were observed over Greenland on Aug. 27th. Now the waiting begins for the southern season expected to begin in November. Marianne's Heaven On Earth Aurora Chaser Tours Chasethelighttours.co.uk invites you to join them in their quest to find and photograph the Aurora Borealis. Experience the winter wonderland in the Tromsø Area. "It was also seen in the Xinjiang and Tianjin provinces of China," he adds. "Was it a UFO or a rocket?" According to satellite expert Ted Molczan, it was a rocket. Or rather, a spy satellte. He explains: "The sightings are related to the Thursday's launch of NOSS 3-7, [a pair of surveillance satellites belonging to the National Reconnaissance Office]. The lower, solid streak in Dia's photo was left by the NOSS payloads. 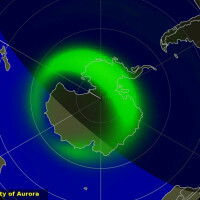 The upper, bright streak is the Centaur that deployed the NOSS into their 63.4 deg, 1100 x 1200 km orbit. The Centaur appears to have been in the midst of the first of two burns to manoeuvre its orbit." "The solid track is the Centaur," says Molczan. "The wide, nebulous streak is the plume from the Centaur's fuel dump, which probably was completed a short time before the photo was taken." The spy satellites are now in orbit. They are latest additions to the Naval Ocean Surveillance System (NOSS). Circling Earth in pairs and triplets, NOSS satellites are used by the US Navy to pinpoint radar and other electronic transmissions from ships at sea. THE SUN IS FLATLINING: Solar activity is very low. There is only one small sunspot on the Earth-facing side of the sun, and it has a simple magnetic field that poses no threat for strong flares. As a result, the sun's X-ray output is flatlining. Inset above are the latest X-ray data from NOAA's GOES satellites. Only a few B-flares interrupt the past three days of persistent low activity. The source of these negligible flares is sunspot AR2430, barely visible on the solar disk. New Horizons took the picture just after it sped by Pluto on July 14, 2015. 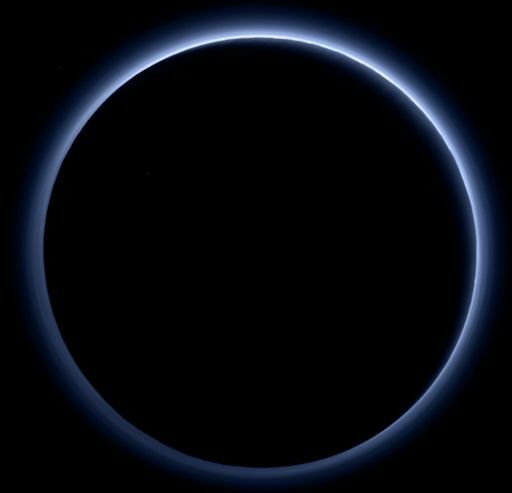 The spacecraft's cameras were looking back at Pluto's nightside as sunlight illuminated the fringe of blue around Pluto's circumference. "Who would have expected a blue sky in the Kuiper Belt?" says Alan Stern, principal investigator of the New Horizons mission. "It's gorgeous." 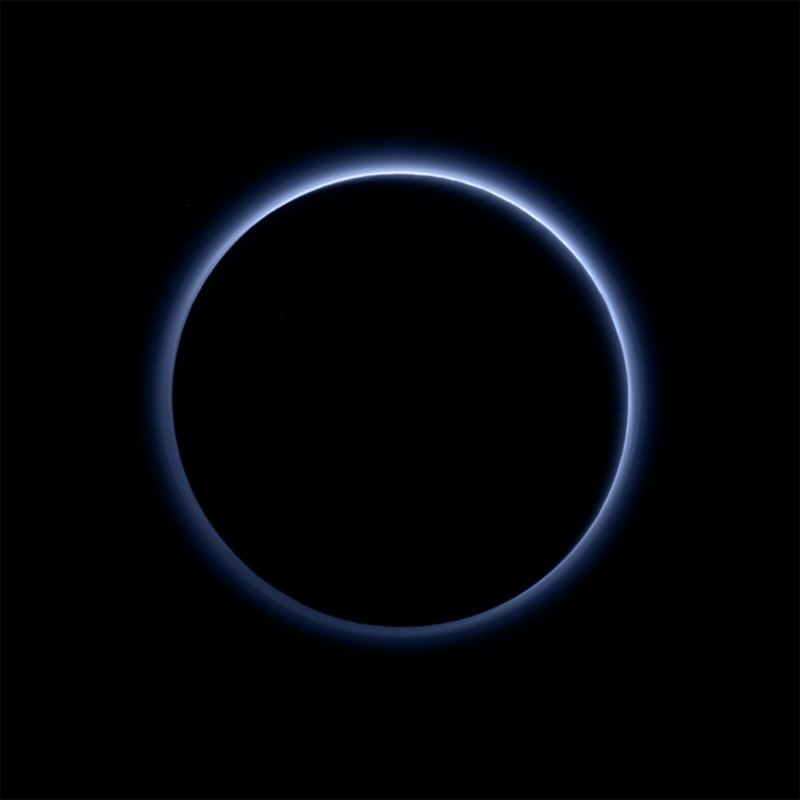 Carly Howett of the New Horizons science team explains the phenomenon: "A blue sky often results from scattering of sunlight by very small particles. On Earth, those particles are nitrogen molecules. On Pluto they appear to be soot-like particles we call tholins." The term "tholin" was coined by Carl Sagan and Bishun Khare to describe organic substances they obtained in Miller-Urey experiments on gas mixtures akin to atmosphere of Saturn's moon Titan. On Pluto, tholins form high in the atmosphere where UV sunlight breaks apart nitrogen and methane molecules. The fragments re-combine to form complex macromolecules. These macromolecules continue to combine and grow until they become "tholins." Ironically, tholins themselves are not blue. They merely scatter blue light. When tholins fall to the ground they show their true colors: gray or red. At least some of Pluto's patchy red coloring is thought to result from a gentle rain of these particles from the planet's atmosphere. Cosmic ray levels are elevated (+6.2% above the Space Age median). The trend is flat. Cosmic ray levels have increased +0% in the past month. These measurements are based on space weather balloon flights, described below. 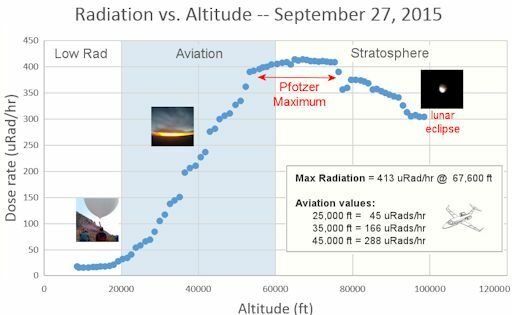 Radiation levels peak at the entrance to the stratosphere in a broad region called the "Pfotzer Maximum." This peak is named after physicist George Pfotzer who discovered it using balloons and Geiger tubes in the 1930s. Radiation levels there are nearly 100x sea level. Note that the bottom of the Pfotzer Maximim is near 55,000 ft. This means that some high-flying aircraft are not far from the zone of maximum radiation. Indeed, according to the Sept. 27th measurements, a plane flying at 45,000 feet is exposed to 288 uRads/hr. At that rate, a passenger would absorb about one dental X-ray's worth of radiation in 5 hours. Stay tuned for improvements to this section in the days and weeks ahead as we develop a glossary and better plain language strategies for communicating this information. Suggestions are welcomed. 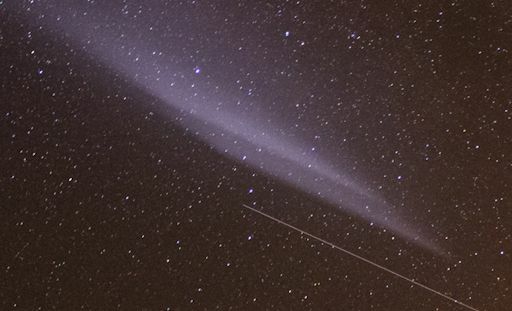 On Oct. 10, 2015, the network reported 25 fireballs. On October 10, 2015 there were 1617 potentially hazardous asteroids. 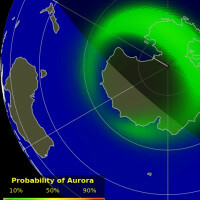 ©2015 Spaceweather.com. All rights reserved. This site is penned daily by Dr. Tony Phillips.